If you're searching for ancestors in England, do you use FreeReg? 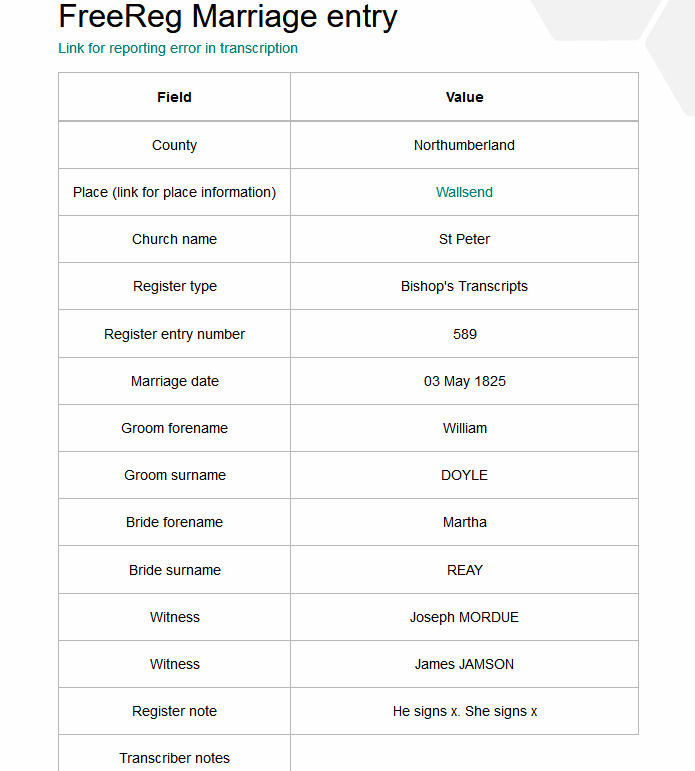 It is a new-to-me website which offers transcriptions of baptism, marriage, and burial records from parish registers, non-conformist records, and other sources in the United Kingdom. The top of the search page offers search fields for surname, forename, and beginning and end year for searches. There are also places to choose county and location within the county. You can choose to search for only baptism, marriage, or burial records, or you can search all three. Be aware that if you search only a surname (without a given name) and there are over 250 results, they won't be shown. It seems there must be a few qualifiers (given name, search dates, etc.) if the surname is a common one. Scroll down a little more and you are offered several more choices. Find family members of your person of interest; find the person as a witness; use soundex; and/or search nearby places. I searched for Martha Reay in Northumberland, all record types, and asked for family members to be included in the search. Below are the results. I clicked on the detail for Row 3 and was shown the information below. It happens that I already have a copy of the parish register's record of Martha Reay's marriage to William Doyle but if I didn't this would be wonderful information and a good starting point to try to find the original record. I've used FreeReg for only a few searches but have already found information about burial dates and locations for several ancestors. As with any transcription, one must be aware that there could be errors. It's always best to find a copy of the original document if at all possible. I'm thrilled to find one more resource for finding my British ancestors and consider it a helpful finding aid. Maybe it will be helpful to you, too. Copyright © 2017, Nancy Messier. All Rights Reserved.